Number of Tests in Fluoride Test Kit? Good afternoon, Joe, and thank you for your question about the fluoride test we carry. The National Testing Laboratories test package for fluoride comes with sample collection and mailing supplies for a single water sample. Therefore, you would need one test kit for each sample that you wish to test. As the debate over fluoride in the public water supply rages on with no apparent end in sight, many people opposed to the idea of fluoridated drinking water have started installing specialized water filtration systems to remove and/or reduce fluoride levels in the water coming out of their faucets. Several other parents chimed in about the quality of the water of the water at the restaurant and eventually the conversation worked its way around the table until finally some asked if we knew of an inexpensive filter that would remove fluoride and get rid of ‘that nasty chlorine taste’. Apparently one of our other friends spilled the beans about our interest in water quality at some other gathering we couldn’t attend. Not wanting to miss the opportunity to share a bit of water quality knowledge with an eager audience, we pulled out the laptop (since the restaurant DID have free wireless service… despite its lousy water!) and visited a few sites that we knew carried water filters to reduce fluoride in drinking water. One noteworthy thing we noticed right away: Although genuinely interested in improving the taste of their water and having the option of whether or not their families consumed fluoride via tap water, few seemed willing to cross the $200 mark for a system. Whether a sign of economic hardship in average families or an indicator that people really don’t care THAT much about the quality of their water, we do not know and we dare not get too involved in topics like that. At this point we would like to point out that we had more than enough parents in the restaurant watching the kids play in the ball pits, blast aliens on the video games, etc. that our small little group’s conversation did not in any way jeopardize the safety of any children OR result in the disruption of others’ peaceful enjoyment of the establishment. So… With THAT declaration out of the way, our searches and discussions brought us to the doorsteps of two products that seemed to meet our audience’s needs: the Undersink Fluoride Filter Triple and Pentek RO-3500 Water Filter System. Both water filter systems claimed to reduce fluoride levels — and on that note we want inform all of you that pretty much NO fluoride filter we came across totally removed fluoride from drinking water — and so we’ll flip a coin to decide which system we discuss first. * flip * . . . . . Heads. The Crystal Quest Triple Under Sink Water Filter wins. Cost: Ringing in at the cash register between $173 and $213 depending upon how long you want the multi-stage filter last. You have the option of 10,000, 20,000 or 30,000 gallons. 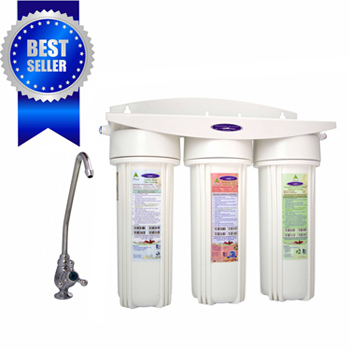 Last time we checked, Filter Water had the unit available (with all three third cartridge options to choose from) with free shipping in the Continental United States. Fluoride Reduction: In this unit’s second filter cartridge, water travels through fine-mesh ‘pre-resin media’ (SIR-900) to reduce fluoride below 0.5 ppm. 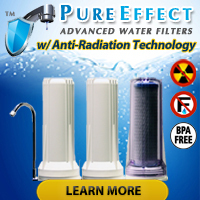 At the same time, this filter also reduces arsenic levels if present. Other Contaminants: In the first cartridge water passes through a carbon block which removes and/or removes volatile organic compounds (VOC’s), insecticides & pesticides (such as atrazine and simazine), and a number of industrial solvents commonly found in drinking water. Chlorine taste and odor also get reduced in this stage. Our ‘Final’ Opinion: If you want a simple under sink water filter system that will do a lot to improve the taste and safety of your drinking water, the Crystal Quest Triple Under Sink Filter stands as a solid contender from what we have read. Well worth taking a look at if you want to keep spending down and still reap the rewards and benefits of a fluoride (and other contaminants) water filter. 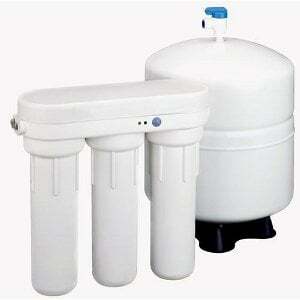 And now we shall discuss the Pentek RO-3500 Water Filter System. . . Cost: Ringing in at the cash register at either $199 and $259 depending upon whether or not you want an electronic monitoring system keeping an eye on the effluent stream (water treated by your unit), this unit packs quite a punch for the money. For around $200 or $260 dollars homeowners can get their hands on a reverse osmosis water system certified and tested to NSF/ANSI Standard 58 for the following: Arsenic (Pentavalent) Reduction, Barium Reduction, Cadmium Reduction, Copper Reduction, Chromium (Hexavalent) Reduction, Chromium (Trivalent) Reduction, Cyst Reduction, Fluoride Reduction, Lead Reduction, Nitrate/Nitrite Reduction, Radium 226/228 Reduction, Selenium Reduction, TDS Reduction, Turbidity Reduction, Chlorine Reduction – Aesthetic, and Taste & Odor Reduction. Fluoride Reduction: As stated in the last paragraph, the Pentek RO-3500 Water Filter System has passed rigorous testing by an independent laboratory proven that it’s fluoride reduction capabilities meet the requirements of NSF/ANSI Standard 58. Other Contaminants: We already discussed how the Pentek RO-3500 has tested and certified to NSF/ANSI Standard 58 for the reduction of a bunch of potentially dangerous and definitely unwanted drinking water contaminants so we won’t bore you with the full list a second time. Some people feel they waste water since not all of the water that goes into the system will wind up as usable drinking water and gets discharged as waste. 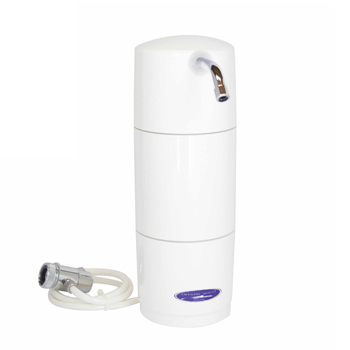 The water generated by reverse osmosis systems tends to have an aggressive nature. 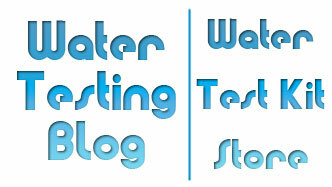 Reverse osmosis water treatment systems produce ‘flat’ tasting water that some people find a bit unpleasant. Because of that taste many owners of reverse osmosis systems choose to install a simple post-ro re-mineralizing cartridge that adds important minerals for taste and nutrition while also balancing the pH of the water before consumption. OK, so having said ALL that, we found the Pentek RO-3500’s NSF Certification extremely appealing since it ‘guarantees’ the performance of the unit for at the very least, its ability to reduce concentrations of a known list of contaminants. Well, Andee, it just so happens that Crystal Quest, the manufacturer of the disposable countertop water filter we wrote about recently, does, in fact, make a disposable filter that reduces fluoride levels in drinking water. They call it the Fluoride Multi PLUS and from what we can tell, it does all the things that the other filter did plus it reduces fluoride levels… without jumping up too much in cost. Why the concern over fluoride? Reducing/Removing fluoride from drinking water? The disposable, zero-maintenance Crystal Quest Countertop Fluoride Filter mentioned above will most certainly help reduce fluoride levels in drinking water, but what if a person wants a filter that offers more robust filtering features? We get questions asking us about test kits for fluoride on a regular basis and today we have some exciting news: FilterWater.Com has partnered with National Testing Laboratories and now carries a home drinking water test kit for fluoride that allows homeowners to find out if their water contains fluoride, and if so how much, in as little as 5 days. While considered ‘safe’ by the USEPA for use as a drinking water additive that helps prevent tooth decay, countries in Europe and other places around the world have outlawed its use because of studies that have shown a correlation between fluoridated water and serious health problems. Fluoride exposure linked to sperm damage? Fluoride in water linked to lower intelligence? While Water Testing Blog has not, yet, determined exactly what to think about fluoride — except thatthe topic definitely deserves some serious consideration — many others out there have made up their minds on the matter and published lists such as, if not very similar to, 50 Reasons to Oppose Fluoridation. I have well water so I’m safe from fluoride, right? Wrong. Fluoride can occur naturally in ground water and some cases naturally occurring levels of fluoride actually exceed levels deemed ‘safe’ in municipal (city/public) water systems. Other testing methods for fluoride? 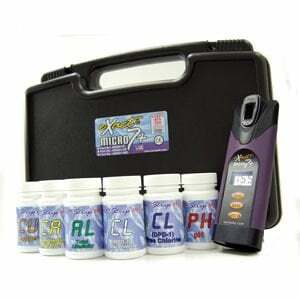 Aside from having fluoride levels tested along with a bunch of other important drinking water parameters using a mail-in kit such as the WaterCheck Laboratory Test Kit ( what it tests for ), homeowners can either call a private water testing firm in their area (always make sure the lab has the correct certifications!) 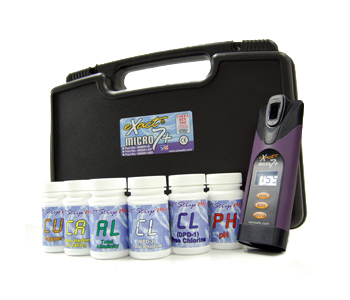 or use a meter like the eXact Micro 7+ Water Testing Meter along with the proper fluoride reagent delivery system (sounds much more complicated than it is!) to test fluoride levels in their drinking water.